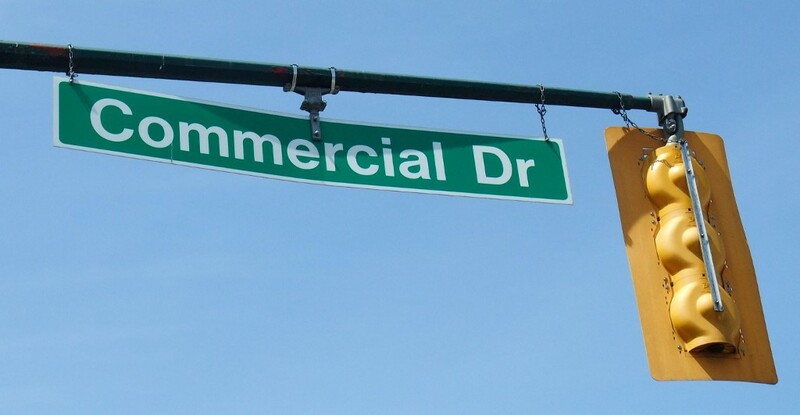 Commercial Drive is a roadway in the city of Vancouver in British Columbia, Canada that goes through the neighbourhood of Grandview-Woodland. However, the neighbourhood is so dominated by the businesses, cultural facilities, and residents along Commercial Drive that the area is far better known as "The Drive" than by the civic boundaries. The district is one of Vancouver's Business Improvement Areas (BIA). The district is served by many different bus routes, as well as both the SkyTrain's Expo Line and Millennium Line at Commercial–Broadway Station. It is home to an active street festival culture; notable annual events include the Vancouver Dyke March in August and the Parade of the Lost Souls in October. It also plays host to Vancouver's only queer spoken word and musician performance night, Unsweetened (and Outspoken). The Drive is a popular place for Vancouverites who want to experience a safe version of North American counter-culture. The Drive was originally a skid road for dragging logs to the harbour. It was named "Park Drive" but renamed "Commercial Drive" in 1911, possibly to avoid confusion with other Park Drives in Vancouver. Commercial Drive ends in the south at 16th Avenue, the former end of Vancouver/start of City of South Vancouver, when it diverts to Victoria Drive. A limited light industrial Commercial Street carries on to 22nd Avenue, and around the Selkirk school there, until 54th Avenue as a residential street. In 1891 the Drive became part of the Vancouver-New Westminster Interurban, a streetcar line. The streetcar line encouraged the growth of local businesses and residences, an influence that is still felt today. Two streetcar lines ran down Commercial—there was the Interurban line to Westminster along Kingsway, and the Interurban line via Burnaby Lake. There were also numerous city lines, which continue today as trolleybuses. The Interurban ceased operation in 1954. During the pre-World War One period, a number of speculators—including McSpadden and Odlum (both of whom have nearby streets named for them) -- attempted to turn the Grandview neighbourhood, centered on the Drive, into a real estate area comparable to the West End and the newly opened Shaughnessy Heights. The global financial collapse around 1913 put an end to their hopes. Commercial Drive was the centre of a prosperous suburb during the 1920s, but declined during the Great Depression and never significantly recovered until World War II. One result of this is a significant number of historical buildings and residences in the area. 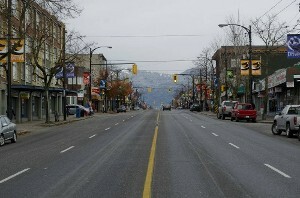 Commercial Drive was originally closer to the centre of town—town being located at Main and Hastings. Since then the focus of town has moved west. Commercial Drive included market gardens, sash and door factories, light industrial, rooming houses, dairies, orchards and open fields. In the urban sprawl of the 1950s the open areas were filled in. After World War II many Italian immigrants settled in eastern Vancouver, and the northern part of Commercial Drive came to be known as "Little Italy". A sizable Portuguese community came to the area as well. During the 1960s, immigration from Asian countries began to dilute the European influence. A wave of Latino immigrants came in the 1980s as a result of the turmoil and civil wars in Central America. Many came from South America as well—the Mercosur Republics. Vietnamese nationals immigrated as well. Throughout the 1980s, The Drive attracted a large counter-culture demographic, including political activists, lesbians, hippies, punks, and artists. Around the turn of the millennium, local outlets of multi-national companies became the target of anti-globalization protesters and civil disobedience campaigns. SkyTrain opened into the neighbourhood with Broadway Station in December 1985. Market forces and the ongoing squalor, drugs and crime of the nearby neighbourhood Downtown Eastside spilled over to the Drive with an increase of panhandling, drunkenness, heroin use and trafficking, litter and filth. Meanwhile, gentrification also came to the district with new condominium housing projects and new storefronts replacing old woodframe stores. In 2002, many restaurant owners were upset with the infamous "dancing police"; bylaw enforcement officers who ticketed establishments hosting any dancing to live music. In late 2004, Commercial Drive gained national notoriety when the media complained that several cafes there were openly selling marijuana. 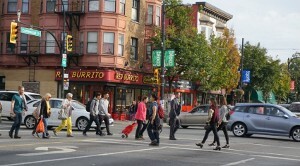 As of 2005, there are still very few large retail or restaurant chains on Commercial Drive. The Da Kine, an Amsterdam style cafe, was raided by police and owner Carol Gwilt charged with trafficking. She was eventually sentenced to prison. The issue has publicised the city's lack of enforcement of Canadian drug laws, and demonstrated a commitment to its stated "Four Pillars" drug strategy. In early summer 2005, Commercial Drive hosted its first car-free festival, in which 16 blocks were cleared of all vehicles and tens of thousands of people celebrated with walks, dancing, and food. The festival has since become an annual event, expanding to other parts of the city in 2008, and as of 2009, the Drive and Main St are to host car-free days every Sunday afternoon throughout July and August. The upper Drive at Broadway has turned into the city's busiest crossroad with the arrival of the second SkyTrain or Millennium Line. This transit system, combined with the B-Line Express bus on Broadway made for a spike in foot-traffic. 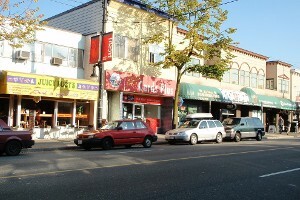 Today Commercial Drive is a multicultural and urban area.